Vimprobable is a very fast web browser that is keyboard controlled. Vimprobable is a webbrowser that is inspired by vim. It can be used mouse-less because it is controlled by the keyboard. The keybindings of vimprobable mimic the vim-keybindings. Vimprobable uses the hjkl motion keys. It is defenitly worth your time to learn how to use the hjkl-keys! Vimprobable is based on webkit, which makes it a very fast browser. 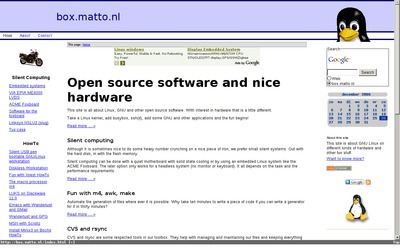 is build as an alternative of vimperator, a Firefox plugin that also aims to be a vim-like webbrowser. 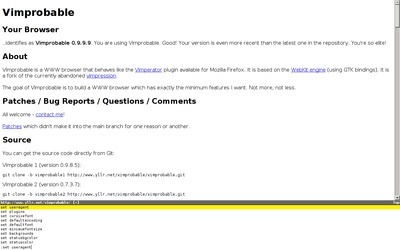 Vimprobable is still in its early stage of develoment, but is already very usuable. It is still a bit alpha, but we are working very hard on it! More on vimprobable can be found on the vimprobable homepage. 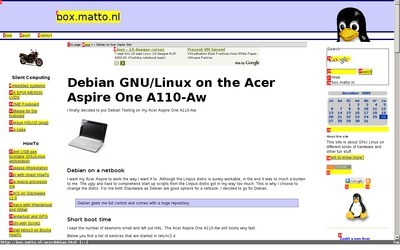 Hints make it easy to follow links with the keyboard. Vimprobable has a very good tabcompletion system! Vimprobable makes a good combination with ratpoison. The result is a fast and keyboard controlled working environment!